Belleville, NJ, USA – August 23, 2017 – VAC-U-MAX proudly announces a new Metal Powder Recovery System (AM-MPRS) for Additive Manufacturing / 3D Printing applications, that now offers conveying, screening, recovering and reuse of metal powders including Inconel, Stainless Steel, Haynes 282, and Cobalt Chrome. The VAC-U-MAX AM-MPRS increases productivity of Additive Manufacturing / 3D Printing Machines by extracting metal powders from the printing bed via vacuum, and then sieving the metal powder for future use – cutting metal powder recovery time by 85%. The new AM-MPRS is designed for ease-of-use, conveying metal powders in a closed system, eliminating operator exposure to metal dusts, and maximizing plant and personnel safety. For more information visit www.vac-u-max.com/AM-MPRS. 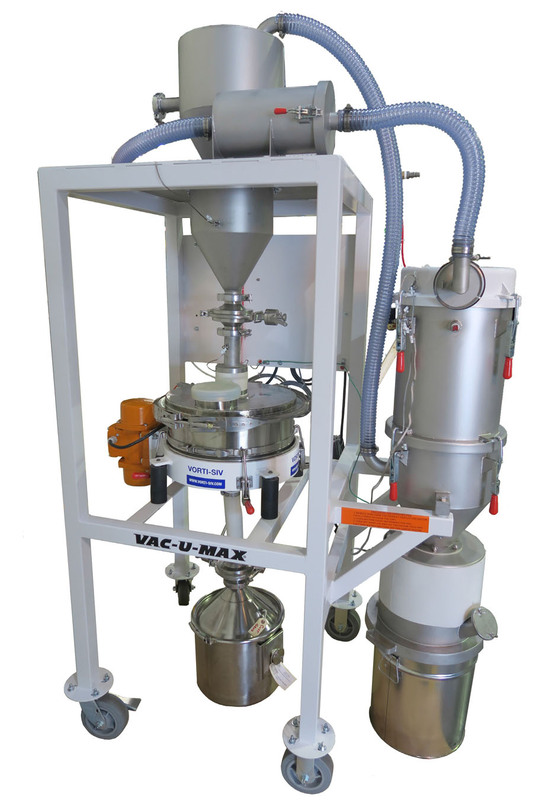 The VAC-U-MAX AM-MPRS utilizes vacuum, with system extracting the metal powder, conveying it to a vacuum receiver, and then discharging the metal powder into a sieve. The sieve discharges the metal powder into a pail, drum or IBC, in a contained and inert environment. System is NFPA 484 compliant for handling metal powders and reduces risk of cross-contamination. AM-MPRS allows full metal powder recovery and quick dismantle without tools. The ergonomic low-profile design and mobile frame allows easy rolling with lockable casters. AM-MPRS includes pick-up hand tool and static-conductive hose with smooth bore. Hoses for non-aerospace applications are available in PVC construction, both FDA and USDA approved. Aerospace applications are offered with flexible stainless-steel hose with smooth bore construction. AM-MPRS offers inert gas-purge fittings and optional gas-purge manifold supplied at customers request. Additional features include HEPA Filter canister with filter, and high-output suspended vibratory sieving machine with US230 mesh, ultrasonic de-blinding kit, and VAC-U-MAX Vacuum Receiver. 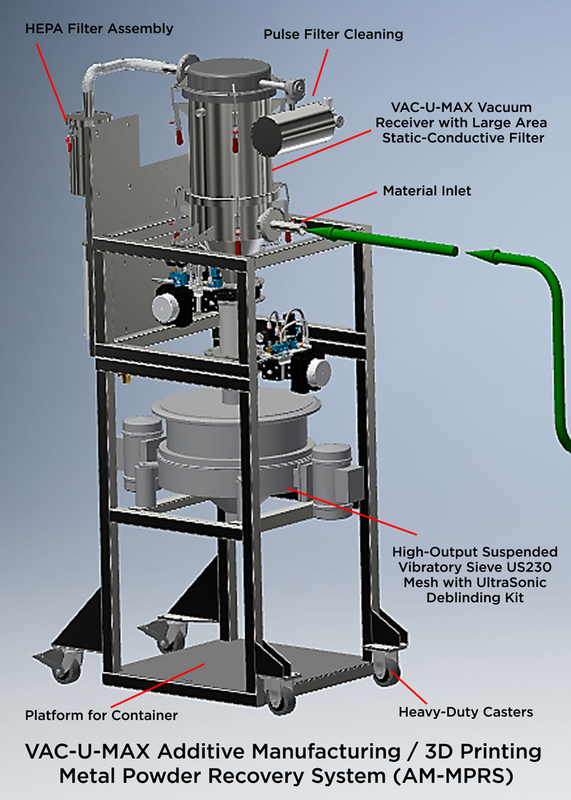 VAC-U-MAX Metal Powder Recovery System for Additive Manufacturing. The VAC-U-MAX 316L Stainless-Steel Vacuum Receiver Package offers 36 square feet of filter area and counter-weighted discharge valve. Vacuum Generator includes VAC-U-MAX’s Single Venturi Power Unit. Compressed-air is driven by a vacuum generator with ½” NPT high-pressure air connection. System requires 35CFM @ 60PSI for operation, with variable orifice assembly for adjustment of vacuum levels. A NEMA 4, UL-Certified VAC-U-MAX Control Panel offers Micro-PLC for Vacuum Conveying functions, starter for sieve, grounding and bonding monitor, and face-mount ultrasonic controls. VAC-U-MAX designs and manufactures pneumatic conveying components and systems for vacuum conveying, batching, and weighing of powders and bulk materials in the food, pharmaceutical and chemical industries. Since 1954, VAC-U-MAX offers solid application and process automation expertise for bulk materials handling, including the design and manufacturing of a full range of industrial vacuum cleaning units and fully-integrated systems for high volume dust, combustible dust, fine powder, bulk material, or liquid recovery.